Available at additional hot shops as well. I have found my perfect salsa. We eat a lot of salsas in my house. Types include the normal Chi Chi’s, Tostito’s, Peppers Blue Crab, Marco’s Salsa’s and even Sam’s Choice Black bean and corn. Rancho Bravo’s Salsa Picante ” Extra Hot” goes to the top of my list. Once I started eating, I could not stop still it was gone. Overall a 9.25 out of 10. Rancho Bravo is a leading Peruvian and international producer and distributor of agricultural products. Their focus is on fresh tomatoes and other fruits and vegetables including carrots, corn, eggplant, green beans, zucchini and onions. What does this mean to you and me? I can tell you hands down that these folks make the best Salsa Picante that you will ever taste. The label is good. Typical colors for a salsa label, but not bold or festive like most U. S. made salsa’s. At first glance, I immediately know this salsa is not a product of the United States. My only complaint is the print is so tiny, the ingredients and description were almost impossible to read. This review is very basic. 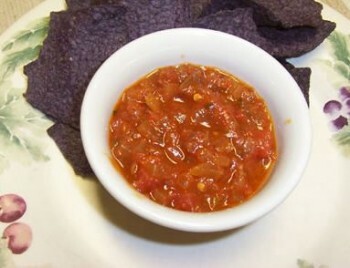 Blue corn chips and Rancho Bravo’s Salsa Picante “Extra Hot”. Add this to other snack foods and my family is set for a quiet New Year celebration at home. Ingredients: Fresh Tomatoes, Fresh Tomato Puree, Red Onions, Peruvian Limo Peppers (Aji Limo), Red and Green Bell Peppers, garlic, Red Wine Vinegar, Cilantro, Selected Spices. What an all-star lineup. No water, no sugar and fresh everything. I’m not familiar with Peruvian Limo Peppers, but wow, this stuff is hot…….Read on. Rancho Bravo’s line of products include ready to eat sauces and salsas totally free of preservatives, stabilizers, artificial colors and flavor additives. Their 5 salsas begin with mild and end with extra hot. Heat: This is the hottest salsa that I have consumed to date. Keep in mind that I can’t handle extracts or munch on fresh habs. I initially got hit with a tongue burn that stayed with me while I consumed the entire 14.1 ounce jar. After about 10 bites my nose started to run and my tongue kept burning. I equate this burn to a cayenne burn that stays on the tongue as opposed to a habanero burn that hits my throat. The heat disappeared about 10 minutes after the jar was gone. I’ll give the heat a 7 out of 10 on the HSB scale. My personal scale would rate this hotter. Consistency: This goes hand in hand with appearance. The texture is perfect. The thickness and ratio of ingredients is perfect. A perfect 10. Overall: I have found my perfect salsa. We eat a lot of salsas in my house. Types include the normal Chi Chi’s, Tostito’s, Peppers Blue Crab, Marco’s Salsa’s and even Sam’s Choice Black bean and corn. Rancho Bravo’s Salsa Picante ” Extra Hot” goes to the top of my list. Once I started eating, I could not stop still it was gone. Overall a 9.25 out of 10. RB Distributers, 6132 Maxie Street, Houston, TX, 77077. I have emailed them at ccu@ranchobravo.com, but have not heard back. If anyone has information on where to buy their products, please post. I’m gonna buy a case. I hear you. I’ve been dealing with this pattern for over 3 years. My next review will be on paper plates! LOl… ? for ya.. can you taste the Cilantro in this? is it a powerful taste? Personally Im not a fan of a strong Cilantro flavor but despite that, the freshness and heartiness of this salsa still makes me want to give it a whirl. Bell peppers, onions, garlic and heat…. YUM! Nice review. I learned of Cilantro after moving to AZ, fell in love with it. It is pretty strong and a little goes a long way, thats for sure. I think thats the issue I have with it as a seasoning. I have been known to be a little heavy handed when adding flavors to food. I find I have the same problem with Oregano. Just always find the two overpowering. Thanks for the review! I’m glad you liked it. Anyone interested in this product can email me at ccunderwood@gmail.com and ill be happy to ship to you!! I tried their salsa this past weekend at the 20th Annual Fiery Food and BBQ Show. I thought it was the BEST salsa I have ever tried. When I saw that they were from Houston, I got one of their cards. Of course, I left the card at home, but will come back tomorrow and give you the info. I did notice their email address listed on the card is different from what you mentioned. I agree with you Ako, maybe not the best ever, but very near the top of the ladder. It was different in taste, but it was very very good. The other big salsa standouts were Gage Salsa right next to the Bravo stand. Their pineapple salsa was the best I have every tried. Great salsa, great guys! a definite two thumbs up!!! Hey Guys! Thanks for the good word! If you need to get in touch with me you can email ccunderwood@gmail.com. Good to meet all you guys in Albuquerque and hopefully i can make it to Jungle Jim’s and ZestFest in Ft. Worth. I will definitely be at the Houston show as well as the Austin Chronicle Hot Sauce Festival. You better get to Jungle Jim’s Chris, you got to meet the other strange Chileheads you missed in Albuddahquerque. It was nice to meet you too. You can also order this product directly from their webpage. 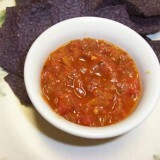 Go to : http://www.ranchobravosalsas.com/ Enjoy!